Last year, FILIPOS ~ the group of Filipino Photographers in Korea ~ held a post-Halloween Party at Bupyeong4-dong Catholic Church. It was the first time that such a huge Filipino-organized Halloween Party was held in Korea. Almost 200 hundred people attended the said event. The entertainment was topnotch and the food was delish! We had so much fun that the organizers decided to do it again! 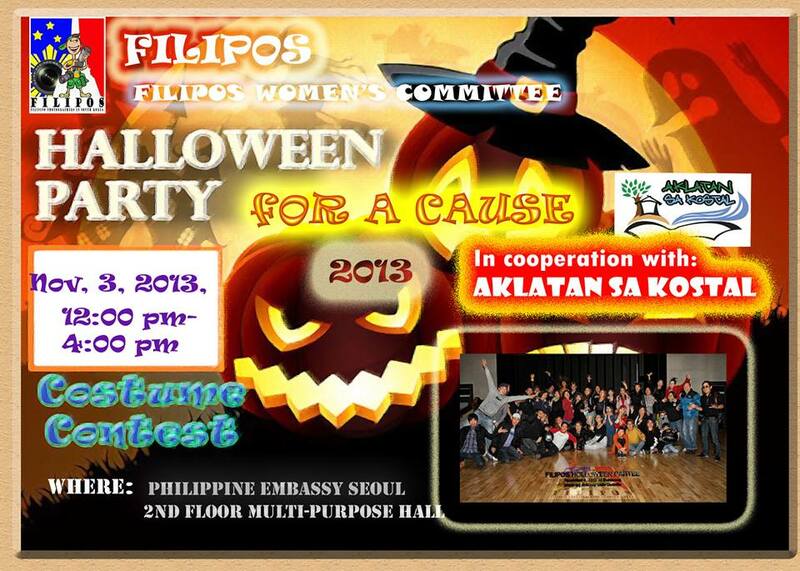 This year, the post-Halloween party of FILIPOS will be held at the Multi-purpose Hall on the 2nd floor of the Philippine Embassy in Seoul on SUNDAY, November 3 from 12 noon to 4 o’clock in the afternoon. Last year, the beneficiary of the party was “Inang Bayan Initiative“. This year, the beneficiary is “Aklatan sa Kostal” ~ a library located in Camarines Norte. It is a project of DJ Regina, who is now in the Philippines. Everyone is invited to come to the party. Costumes are suggested but not mandatory. FILIPOS members will be there to shoot photos of anyone willing to strike a pose. Dress up! Make friends! Have fun and be merry!